When the time comes for your nonprofit to start planning its next capital campaign, one thing is certain: hiring a capital campaign consultant is a must. Since capital campaigns are such ambitious undertakings, it doesn’t matter how much fundraising experience your organization has under its belt. The fact of the matter is that for nonprofits large and small, you need an experienced partner if you want to reach your goals. Capital campaign consultants aren’t just there to help your team meet fundraising benchmarks. In fact, when you partner with a fundraising consulting firm, your organization gains a partner you’ll rely on to help hone your fundraising strategy over time. 1. Show capital campaign consultants that your organization is ready for a partnership. 2. Conduct a thorough search before hiring your capital campaign consultant. 3. Narrow down your capital campaign consultant choices with key questions. 4. Test the waters with your consultant before you jump into a capital campaign. 5. Extend a winning RFP to your top-choice capital campaign consultant. With the help of an experienced nonprofit professional, there’s nothing stopping you from reaching your most ambitious goals yet! Let’s dive into these key subjects so your nonprofit can get started finding the best partner for your campaign. Bonus! Is your nonprofit planning a capital campaign? Be sure to visit our capital campaign guide to brush up on everything your team needs to know before you start fundraising. Hiring the right capital campaign consultant isn’t only about selecting a qualified candidate. Rather, to find the best partner, your nonprofit should show that you’re ready to take their leadership seriously. When a nonprofit reaches out to a capital campaign consultant and makes them an offer, the consultant has to decide whether or not your nonprofit is a good fit for them. After all, consultants want to know that the nonprofits they partner with have a realistic understanding of the kind of guidance they can offer and a reasonable impression of what a capital campaign might entail. Established in their fundraising history. A nonprofit isn’t ready to take on a capital campaign if they have a short fundraising history, little or no proven fundraising capacity, or are otherwise inexperienced. A capital campaign consultant, however, can provide actionable steps that will help your organization prepare for a major fundraising effort. Ready to put in the work. When you make your proposal to a consultant, it’s a big turn-off if they feel like you’re expecting magic to happen without putting in the work and participating. Partnering with a capital campaign consultant is just that: a partnership! Make sure your team is ready to follow their leadership, not take a backseat to your own campaign. Prepared to make the necessary investments. Capital campaigns aren’t only the most ambitious fundraising projects an organization will embark upon; they’re also the most expensive. Show prospective capital campaign consultants that you’re prepared to fully fund your desired campaign so they take you seriously. To be clear, at some point in their history all nonprofits have been inexperienced in fundraising, unprepared for the cost of a large campaign, or both. There’s nothing wrong with not being in perfect shape as an organization! But it’s important to understand that biting off more than you can chew is one of the most common mistakes nonprofits make (and one of the most detrimental). For this reason, capital campaign consultants make a point to only partner with organizations who are ready (or nearly ready) to take on a big campaign. When institutions aren’t quite ready yet, consulting firms may suggest a partnership to help build fundraising capacity or revitalize an organization’s fundraising strategy. Bonus! Need to brush up on the logistics of capital campaign planning before hiring a consultant? 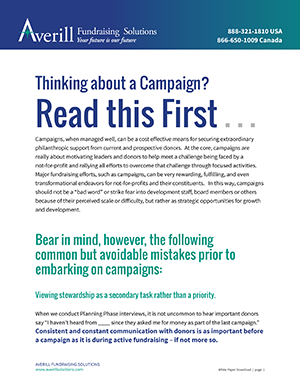 Visit DonorSearch for their in-depth capital campaign guide to learn more. Finding the best-fit capital campaign consultant for your nonprofit also depends upon conducting a thorough search before settling on a firm. While your nonprofit may know of a great regional fundraising consulting firm or have worked with a nonprofit consultant in the past, don’t just go with the first firm that your team comes up with. Building a list of recommendations from peers. Your team’s best resource when searching for a capital campaign consultant is peer referrals. Ask around with your peers at other nonprofit organizations and see who they partnered with for their latest campaign. Then, build a contact list from the most successful partnerships. Searching for qualified consultants on the web. Put web searches at the forefront of your capital campaign consultant hiring strategy. Your team should do extensive web research on potential partners that takes into account their reputation among former clients and their fundraising track record from publicly available information. Leveraging a fundraising consultant directory. Nonprofit networking associations often publish directories of the top fundraising consultants. 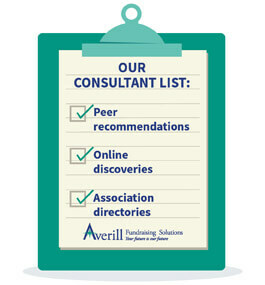 Be sure to reference these directories when building your list of consulting candidates! Check out the Association of Fundraising Professionals online directory for a great example. After your team has completed preliminary research into nonprofit consulting firms, you’ll need to draw up a shortlist of possible leads. Select between 5 and 10 capital campaign consultants that you’ll continue to evaluate. This roster will serve as your guide during the rest of your search! Now that you have a shortlist on hand of possible capital campaign consultants to follow up with, your team should start determining which of these candidates would make the strongest partner. While there’s no surefire way to predict which capital campaign consultant will lead your organization to fundraising success, your capital campaign planning committee can narrow down your selections by asking some key questions. Do they have a history of serving nonprofits like yours? You might be best served by selecting a partner who has already worked with a nonprofit with a similar constituency, budget, or mission as yours. Or, your team may want a capital campaign consultant who is able to adapt to diverse fundraising circumstances. Are they practiced in working with nonprofits on a similar scale as yours? A capital campaign consultant won’t be the right fit for your team if they have only worked with nonprofits who operate at a different scale as yours. Small and large organizations all have unique fundraising challenges that your consultant should be equipped to address. Are they a good cultural fit? Even the most experienced capital campaign consultants won’t be able to serve your nonprofit if they’re a poor fit culturally. Review the past clients of different consulting firms to determine the clientele they work best with and make an assessment of the kind of attitude you want to see in your future partner. By evaluating your shortlist of capital campaign consultants against these key questions, your team will gain a better understanding of the kind of consultant who will be able to serve your nonprofit best in reality—not just on paper. As you refine your top choices, select 3 to 5 qualified capital campaign consultants with whom you’ll follow up. One of the reasons why embarking on a capital campaign is so much of an investment is because partnering with a nonprofit consultant can be costly. While their expertise and leadership is certainly worth it, your team should really test out a nonprofit consultant partnership before diving into a capital campaign. Fundraising feasibility studies. Feasibility studies are a necessary part of planning a capital campaign, so use your fundraising planning and feasibility study as a trial-run period to see if your capital campaign consultant will be a good fit for the entire capital campaign. Annual fund direction. Many consultants suggest growing your annual fundraising capacity before launching into a capital campaign, and there’s no better way to get to know a consultant than having them direct your annual fund. This way, your organization will build capacity while determining whether or not your partnership is built to last. Embedded staffing. 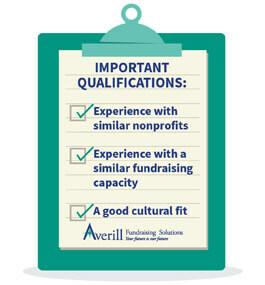 Sometimes roles at your nonprofit need to be filled by an experienced fundraising professional. Consider hiring a consultant as an embedded staff member to see how they affect your organization from the inside out. At the end of the contract, you’ll know for certain if they’d make a great capital campaign partner. Once you’ve established a fundraising relationship with a nonprofit consulting firm, you’ll be able to evaluate them up close and better determine how well they can serve your team as a capital campaign consultant. However, that’s not the last step in the process! To finalize a partnership with a capital campaign consultant, you’ll need to send them a Request for Proposal (RFP). A Request for Proposal is a document that nonprofits send to potential capital campaign consultants. Once a consultant receives your RFP, they will either decide to deny your request or offer a formal partnership proposal. In your RFP, your team will outline its capital campaign goals, an overview of your fundraising strengths and weaknesses, and details on the kind of partnership you’re looking for. Your nonprofit is excited to collaborate with them to reach your goals. Leaders at your nonprofit are committed to the capital campaign. Your budget and capacity are robust enough to take on the campaign. Communication is key in a successful proposal request! Be completely transparent with your preferred capital campaign consultant. You want them to know your nonprofit is ready to take on the challenge of an ambitious capital campaign and would make a strong partner for their leadership. 1. They’ll send your team a written proposal in which they’ll outline their plan for your nonprofit’s capital campaign. 2. Your team will conduct an interview with them over the phone or in person to informally discuss the proposal. 3. The consultant will present their proposal in a formal meeting with your capital campaign planning committee and other key insiders. 4. Following the proposal, your team will choose whether or not to initiate an official contract to the capital campaign consultant. Once the contract is signed, you’re ready to start formally planning your capital campaign! After the planning process kicks off, your nonprofit can finally start laying the groundwork for the campaign you’ve been envisioning and start taking steps to reach your fundraising goals. Capital campaign planning can be challenging, but with the right capital campaign consultant you’ll have the leadership your team needs every step of the way. 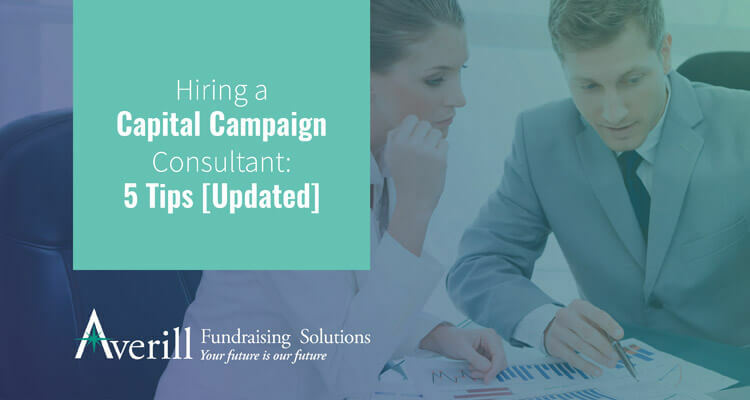 Now that we’ve gone over our top tips for hiring a capital campaign consultant, it’s time to start your search! How to Hire a Fundraising Consultant. Curious for more fundraising consultant hiring strategies? Be sure to review our expert guide to forging these important partnerships. Top 25 Fundraising Consultants. Looking for fundraising consultant recommendations? Visit DonorSearch to learn about their top picks. Top 10 Capital Campaign Consultants. Do you need a place to get started? Visit Re:Charity for their reviews of their favorite capital campaign consultants.